Prior to every race, Marcel Schot will focus on one driver, one track: the relationship between the human being and tarmac. 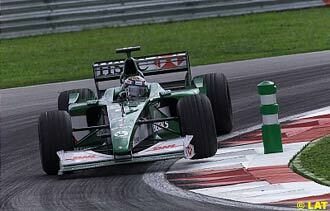 This week, we review Eddie Irvine's past at Sepang. Even though Sepang has had a very short history with one Michael Schumacher as a very dominant factor, it's perhaps more interesting to take a look at another driver who set quite distinctive performances in the two years that the Malaysian Grand Prix has been held so far: Eddie Irvine. Whereas his 1999 result was, in terms of points, more successful than his 2000 accomplishment, strangely enough his 2000 performance is in fact the more impressive one. When the Formula One cars turned their first laps on the wet Sepang circuit, on Friday October 15th 1999, Eddie Irvine found himself in a double mindset. He was battling for the World Championship with Ferrari against McLaren's Mika Hakkinen, yet his future was already with the Jaguar team; Irvine's teammate, Michael Schumacher, was finally back from being sidelined with a broken leg after his shunt at Silverstone; and, with Irvine as Ferrari's sole contender for the title, it was largely believed that Schumacher delayed his return to racing until then, because he wasn't too eager to help Irvine win the title for which the German was brought to Maranello in 1996. Even though the battle was Irvine Vs. Hakkinen, the returning Schumacher got the most attention right from the start of the weekend. Not strange, considering he was running extremely fast from his first lap. The German was back and Irvine was demoted yet again to the second driver, within the blink of an eye. After Friday's morning session, Schumacher was fastest, a second ahead of the rest. Irvine finished the morning in fifth, which wasn't too disappointing considering the McLarens were in ninth and tenth. In the afternoon, the track was fully dry and with the drivers more and more familiar with the circuit, times were dropping fast. During the afternoon session, Irvine managed to take 3.4 seconds off his morning time, to bring it to 1:42.725. Surprisingly this brought the Ulsterman to fourth position, behind Jacques Villeneuve, David Coulthard and Jean Alesi, but ahead of Michael Schumacher. His main rival Hakkinen still wasn't able to get upto the pace. The Finn was stuck in eighth place, complaining that he didn't have a decent lap towards the end of the session because of traffic and yellow flags. On Saturday morning, the Ferrari train really got rolling. Both Schumacher and Irvine improved their times by two seconds, striking a large gap over Mika Hakkinen, who finally got going and finished third. However, Saturday morning practice doesn't do much for a driver if he can't continue to stay fast after the lunch. When qualifying got underway, the Ferraris remained the only cars lapping Sepang in less than 101 seconds, but after their first set of laps they were nearly half a second slower than in the morning. With both McLarens already near, the Maranello men were as usual under pressure. However, when qualifying finished, things looked very bright. 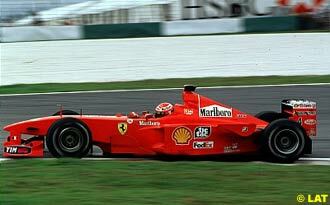 Schumacher was on pole, with an incredible 1:39.688 and Irvine completed the Ferrari front row. He was just two tenths ahead of the McLarens, but still comfortable, as both Ferraris only ran three of the possible four stints. As the race started, it soon became clear what Michael Schumacher's part would be for the remainder of the season: the German did everything possible to help Irvine win that race, and subsequently the WC title. At the race start, Schumacher took off very fast, followed by his teammate and the McLarens. After four laps, he handed Irvine the lead, subsequently letting David Coulthard past in order to fend off Hakkinen himself. Unfortunately for Irvine, Coulthard was faster and was quickly catching up. However, when the Scotsman was getting ready to take over the lead, his McLaren failed. With no fuel pressure, Coulthard had to abandon the race, leaving Irvine in a comfortable lead. Meanwhile, Schumacher was successfully fending off Hakkinen and subsequently increasing Irvine's lead. 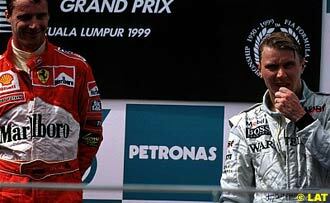 With Hakkinen now over ten seconds behind and seemingly unable to find the extra speed to battle Schumacher, the German put his car into overdrive and lapped Sepang a second faster than anybody else. With the pitstops just around the corner, Irvine saw his teammate closing in fast. This was just the first sign of Schumacher's power, almost like saying, "Eddie, I'll help you towards the title, but you must remember one thing: I'm the number one." 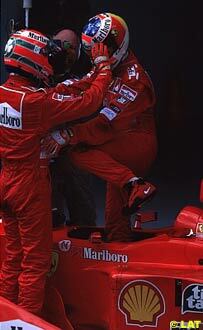 After 25 laps, Irvine was the first to dive into the pits, handing Schumacher the lead. Mika Hakkinen followed with his stop two laps later and Schumacher another lap later. After the stops, the situation from before was in place again: Irvine leading, with Schumacher behind, closely followed by Hakkinen. With Schumacher effectively blocking Hakkinen, Irvine was now able to open a big gap fast. When the Ulsterman stopped again after 41 laps, his lead was nearly 20 seconds, allowing him to come back onto the track some five seconds behind Schumacher and Hakkinen. When the McLaren driver finally made his second stop after 47 laps, there was only one thing between Irvine and his victory: Schumacher. With just a few laps to go, the German for the second time clearly dropped his pace to let Irvine take the win. However, the celebrations didn't take long. About two hours after the race, word comes out that both Ferraris have been disqualified due to irregularities with the measurements of the bargeboards. Nevertheless, celebrations could be resumed six days later, when the disqualifications were reversed again by the FIA court of appeal. A year later many things had changed. Eddie Irvine had made the move to Jaguar, and the season proved a disaster. What should have been the return of the mighty Jaguar, had become nothing more than a shy peek from behind a tree. Irvine, not one to keep his lips sealed, complained whenever he felt like it, not improving the team spirit too much. Despite promising performances in qualifying in the first half of the season, the Ulsterman only scored at Monaco, where he finished fourth. With the World Championship already settled and the Constructors' title virtually sealed, Malaysia was just finishing the season for most teams, hoping for a positive vibe to end with. Which is exactly what Eddie Irvine and Jaguar intended. On Friday morning they were already running fast, with Irvine as the best of the rest. The Ferraris immediately struck a large gap, with Schumacher fastest in 1:40.290 and Barrichello a distant second, some eight tenths of a second behind his teammate. 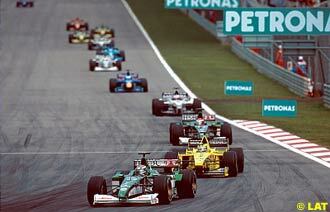 Mika Hakkinen and David Coulthard rounded out the usual top four, another six tenths behind. Irvine, in fifth, was already 2.3 seconds slower than Schumacher. As usual on Friday afternoon times dropped extensively. However, for Irvine this was not the case. Eddie improved, but only four tenths, whereas others made up as much as two seconds. As a result, Irvine dropped to 14th place, which didn't bother him too much as he saw enough potential for qualifying the next day. In Saturday morning's practice session it became already clear that Irvine's confidence wasn't based on thin air. While concentrating on the race strategy, both Jaguars leapt ahead into sixth and seventh, with Johnny Herbert being just three thousands of a second faster than Irvine. Irvine, usually the faster qualifier of the two, was able to keep the pace in the qualifying session. While still working on the setup, Jaguar's first driver put his cat in seventh, behind the usual suspects, and the surprising Alexander Wurz and Jacques Villeneuve. In fact, with the morning session going so well, Irvine was slightly disappointed not to have scored fifth place. For the race, Eddie knew what was expected of him: keep the parts together and his head cool to score a point or two. His first gain was Mika Hakkinen's false start. After four laps the Finn had to serve his stop-and-go penalty, effectively eliminating him from the race. Irvine, now in sixth, decided not to try and get past Villeneuve in a risky manouvre and did wisely so. During the first set of pitstops, the Ulsterman briefly found himself in fifth position, but once everyone had had their stop, he had to settle for seventh, with Mika Hakkinen ploughing through the field on the way back up. During the second set of pitstops, the Jaguar crew serviced Irvine well and managed to get him out again before Alexander Wurz, putting Irvine in sixth position with a safe gap behind him. In that position he finished the race, bringing the team its fourth point. After the race, Irvine commented: "we can be proud of this result. Everything worked right today" - which about sums up Jaguar's potential for its first year: they were only possible to score when all is 100% or when the competition fails. Bearing this in mind, Irvine's step down from Ferrari, where it was only possible to not score when things went very wrong, was a very brave one. Eddie Irvine took the win in one of the best cars and with help of the best teammate, and in contrast scored a single point in one of the worst cars that season. The latter achievement must surely have satisfied Irvine much more and who knows what satisfaction the future will bring the Ulsterman at Sepang; clearly, this is a circuit which fits him well.